I reviewed V-Commandos last year and absolutely loved it, but 12 months later I’m somehow finding space in my heart to enjoy it even more. To recap, V-Commandos is a board game designed by a bunch of guys who either work or used to work at Ubisoft. It’s a turn-based stealth tactics experience, where you team up with friends, take control of an Allied operative and sneak/murder your way through a German facility. It’s all about stealth and visibility, trying to remain hidden as long as possible by keeping to the shadows and making quiet kills. Eventually, though, a V-Commandos mission will kick off, and the game dramatically shifts from a sneaking simulation into a balls-to-the-walls shootout, complete with air strikes, mortars and big machine guns. I’ve spent the last week playing with one of the game’s two expansions, Secret Weapons, which takes the successful foundation of the base game and adds a bunch of thematically appropriate—and really fun!—new equipment and weapons. The idea behind Secret Weapons is that you’re striking deep behind enemy lines at the facilities responsible for radical German weapons like the Ho 229 jet and Goliath remote-controlled tank. The former features as one of the new missions available, as you sneak into a test facility and blow one up, while the latter is now added to the game as a piece of equipment, with German guards able to deploy the little vehicles against you (though by seizing their remote control you can turn the tables). While this looks bad (I’m the Australian-flagged guy in the corner), it’s actually OK, since the smoke grenade (red token) has me hidden from the Germans. Some of the expansion’s other new pieces of gear are more interesting, though. Gas barrels can be shot or blown up from an adjacent space, killing everyone exposed (barring a new type of German soldier with gas masks, of course), while smoke grenades can now be tossed into rooms or spaces to cover your movements. Which makes things easier for Secret Weapons’ most important addition, three new commandos. There’s the Butcher, an Australian hand-to-hand combat specialist, the Gunner, who drags a mortar around, and the Intel Officer, a good all-rounder for the stealthier missions. Each one brings an entirely new way to approach the game (you can of course now use them in the main game as well), but I especially loved the Butcher, whose lack of a firearm but capacity for loads of equipment like smoke grenades made him an absolute joy to play as I swept him through bases knifing everyone in his path. Secret Weapons doesn’t really do much other than add new things to the base game—it integrates into the main game by shuffling objective cards, rather than standing alone—but that’s all it needed to do. The base V-Commandos experience was already fantastic, so rather than risk tampering with such a solid tactical bedrock, the designers were smart enough to just come up with new stuff that increased the variety of dangers and tools available to the player. 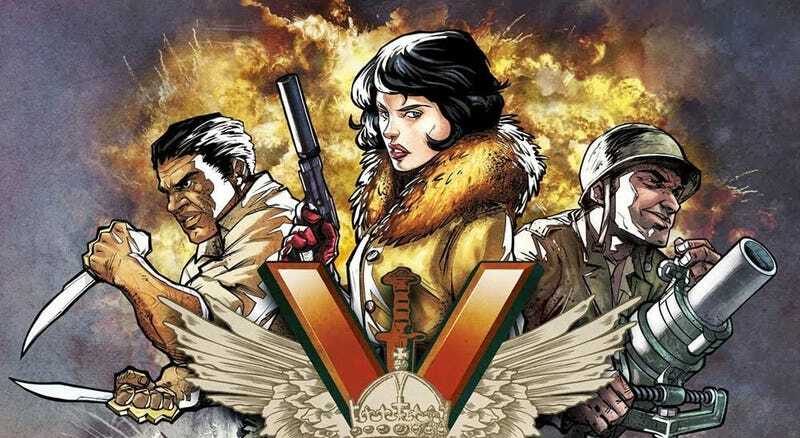 The best thing about V-Commandos is the way that it requires players to get together every and sand table their way through, coming up with the best ways to coordinate their efforts given the limitations of what each can accomplish every turn. Secret Weapons simply adds to the options available, both in terms of what you’ve got and what you can do, and that’s all I can ask for in an expansion to a game like this. While we’re here, I wanted to share a story that sums up why I love this game so much. A few months after my review of the base game, I took V-Commandos on a weekend board gaming trip with some friends, and we settled in for a lengthy run at one of the biggest maps you could play. I can’t remember which one it was, and can barely remember our objective, but I do know that we had to coordinate an attack from two directions in order to plant some TNT then blow something up, then get the hell out of there. For the first half of the map, everything went swimmingly, as we split into two pairs and stalked our way through the map, knifing Germans in the dark and looting uniforms we could wear as disguises. Once we arrived at the target, we planted the explosives, legged it to the next room and set them off. And that’s when everything went to hell. Setting the charge, not knowing that within ten minutes half the table would be dead. The explosion had triggered the base’s alarm, which sent every German on the map rushing towards the source of the explosion, and they promptly discovered us huddling in the corner of a supply room. With stealthy options now off the table, it was time to start shooting, and in an effort to divide the pursuing Germans—and give at least two of us a chance to escape—we split up once more, each pair racing down one edge of the level towards a centrally-located exit. We were fast, and loaded with guns, but the Germans—now being heavily reinforced with fresh troops from off the edges of the map—started to overwhelm us. That’s when the sandtabling I mentioned above resulted in some noble, and ultimately hilarious, sacrifice. The bottleneck design of the map, coupled with the gear we were carrying, meant that two of my friends carrying wounds (and explosives) decided to blow themselves up to ensure mine and another healthier pal’s survival. So while we continued legging it down the edges of the map to the escape point, one detonated some TNT on himself (which not only killed him but also his pursuing Germans), and the other dropped a grenade into a locker room he’d been cornered in, knocking out a good number of the guards chasing him. I was the officer, my buddy the sniper. And I was about to take some serious damage. Me and my other buddy were far from safe though. We had to shoot our way into a large house from opposite ends, taking hits ourselves as we used the last of our equipment in a desperate attempt to mow down a final wave of Germans standing between us and our escape. Finally, with both of us wounded and on the verge of death, we stumbled towards the entrance of the house, a turn away from victory. Only...that was also an enemy reinforcement point, and the room was now full of elite German guards. With our movement points spent, all they had to do was walk over, fire a few shots and our mission was over. Resigned to defeat, we surveyed the carnage, revelled in an afternoon well-spent despite the defeat, and went to make the German’s final movements to end the game. And that’s when we noticed the event card, which we hadn’t paid much attention to since its resolution didn’t come until later in the turn. Before every turn in V-Commandos, you draw an event card, which determines the direction that patrol routes will take for that turn, and also lays down a special effect or action that will spice things up. And that turn, in that moment, the card revealed that a pair of Stukas would dive bomb any room with an escape hatch, killing everyone inside but leaving the evacuation point intact. There was only one room with an escape hatch, and it was the one we needed to get out through. Still not believing our luck, the bombers destroyed the room, killed every German inside, and allowed the pair of us, wounded and out of gear, to limp our way to safety, and ultimately, victory. It’s perhaps the single greatest board game experience of my life. A perfect blend everything that I love from a tabletop experience: strategy, cooperative planning, skill and blind luck, all coming together to create a moment that was closer to something you’d find in a 60s WW2 movie than a gruelling stealth tactics experience. From my friend’s sacrifice to that final glorious slice of good fortune, V-Commandos had given us the platform to have one of the best afternoons we’d ever had as a board game crew, and I’ll be forever thankful to it for that.